While on a recent trip to the Dollar store I picked up a bag of bird seed. Our winter has been unusually mild and we have enjoyed a bit more time outside. We have made some yummy treats for the animals before (see here), so I thought we could make something with the seeds. We spread Sun Butter (MJ is allergic to peanut butter) on some pinecones and a toilet roll. Then the boys rolled them in bird seeds. We finished them off with some yarn. TJ also wanted to make a bird feeder so we cut a hole in a box and filled it with seeds. Within one day the pine cones and roll disappeared off the tree. Only a small piece of yarn was left. The feeder hasn't been touched after a week. I know it was squirrels who enjoyed the seeds and they just can't get into our feeder. 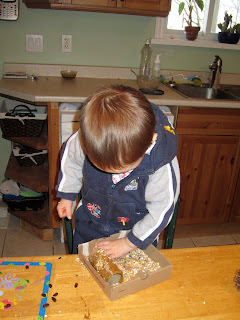 A few days later I made a sensory bin with the left over seeds for the boys to play with outside. I didn't mind at all when they scattered the bird seed on the yard because the squirrels came and cleaned up afterwards! This activity allowed both boys to play. TJ (almost 4) could spread the Sun Butter on his own, while MJ (19months) enjoyed rolling things in the seeds. He needed more supervision with the sensory bin too. It was so cute to see him excited about the squirrels (which he thinks are cats).